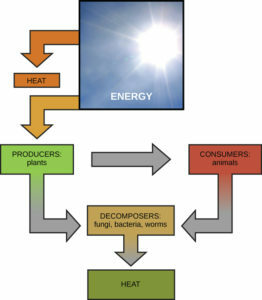 Scientists use the term bioenergetics to describe the concept of energy flow (Figure 2) through living systems, such as cells. Cellular processes such as the building and breaking down of complex molecules occur through stepwise chemical reactions. Some of these chemical reactions are spontaneous and release energy, whereas others require energy to proceed. Figure 2 Ultimately, most life forms get their energy from the sun. Plants use photosynthesis to capture sunlight, and herbivores eat the plants to obtain energy. Carnivores eat the herbivores, and eventual decomposition of plant and animal material contributes to the nutrient pool.